﻿﻿WAIT, MY HOMEOWNER’S INSURANCE POLICY COVERS… GODZILLA?! Well, if you think about it from the stand-point of the insurance company, it kind of does make sense. They’ll throw in coverage all day long for things that probably won’t ever happen, because they probably won’t ever have to cover them. Something like flooding, which happens all the time, though, they have to be a little stingy about – or else, they’d go bankrupt after every hurricane. In fact, as you’ll see below, the states that are the most expensive for homeowner’s insurance are the ones frequently bombarded with hurricanes and tornadoes. I understand an attachment to one’s home, but I often find myself asking – why live in these places? Okay, maybe I understand New York. It’s surprising to me that California isn’t on this list, what with the mud slides, brush fires, and the slow slip into the ocean that everyone likes to predict, but it’s not – and there’s no hurricanes! Who’s already packing? Insurance companies definitely aren’t just throwing in coverage for things that will never happen; in fact, there’s some really great clauses for things that happen all the time – or at least have a greater chance of happening — that you might be surprised to see in the fine print. MOLD – “What?! Lies! Homeowner’s insurance never covers mold!” Aha! You are wrong, sir! That is a myth! It’s true that some insurance companies don’t include coverage for mold, but it isn’t the standard. In fact, many homeowner’s find this out after they’ve already paid a pretty penny for mold damage and could have had the whole thing covered! Of course, there are stipulations for mold coverage, but they’re reasonable and usually have to do with what caused the mold. If your policy covers things like busted pipes, then the mold is covered. If there’s a flash flood, then it’s not. Also, if mold occurs as a result of neglect, it won’t be covered. DOG BITES – “That’s a useless clause. My dog would never do that.” Don’t you think that’s what every person who’s ever had a dog bite someone has said at some point? Every year, 4.7 million people are bitten by dogs, according to the CDC – that results in nearly 800,000 injuries that need medical attention. METEORS – “What?! What good is that?! It’s not like meteors fall every other day!” I’ll give you that one – meteors don’t fall every other day, but they do fall occasionally, and the clause that includes meteors also includes all other things that can fall from the sky. This includes things like tree limbs, debris from airplanes, and as mentioned, meteors. Stipulations for this clause include that the damage must be solely the result of whatever fell on your house – if you let termites eat through your house and a twig fell and knocked the whole thing over… you won’t be covered. 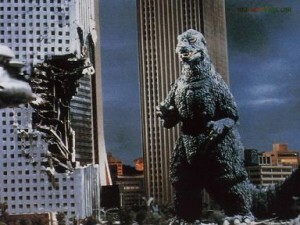 4 Responses to ﻿﻿WAIT, MY HOMEOWNER’S INSURANCE POLICY COVERS… GODZILLA?! Hmm, I wonder if my insurance covers meteors. I guess in the unlikely event that it happened, I’d want to be covered. I live in Florida and yes, the insurance is outrageous. However, it is well worth it considering how close I am to the paradise that is Panama City Beach.